The parliament in Venezuela has approved a law which will tighten the rules regulating internet content. Under the bill, online messages inciting hatred, or political and religious intolerance, are banned. Opposition politicians voted against the measure, which they say is a threat to freedom of speech. 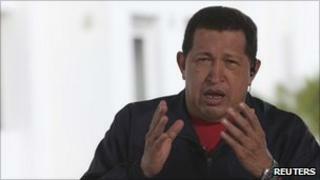 Venezuelan President Hugo Chavez says it will help protect citizens against online crimes. Under the new rules, providers of online contents and internet portals could be fined if images or messages appearing on their sites "disrespect public authorities, incite or promote hatred or create anxiety in the citizenry or alter public order". President Chavez says the law will shield citizens from messages promoting drug use, prostitution and other crimes. "We aren't eliminating the internet here, or censoring it," he said during his weekly television and radio broadcast on Sunday. "What we're doing is protecting ourselves against crimes, against cybercrimes," he added. The Venezuelan Chamber of Electronic Commerce has criticised the measure saying that it is another step on the way to censorship and the blocking of websites. Opposition politicians accuse President Chavez of passing a raft of restrictive laws before January, when a new parliament with more opposition delegates is sworn in. The measure was passed just days after parliament voted to give President Chavez special powers to pass laws by decree for 18 months.